Co-advised by both Dr. John Oliver from the Benthic Ecology Lab and Dr. Ivano Aiello from the Geological Oceanography Lab, I recently defended my thesis examining changes in infaunal communities after tidal manipulation in a tidally restricted wetland. I graduated from Truman State University in Missouri with a B.S. in Biology in 2011. 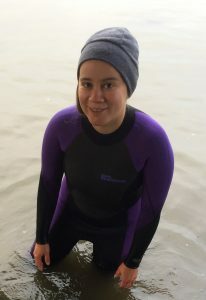 I'm currently working as a lab technician in the Benthic Lab and working on turning my thesis into a peer-reviewed publication.